My students were inspired to create an ebook about life in the 2nd grade. Here’s what they came up with. Our school has been running a project called iPad explorations in 2nd grade, where students have had the opportunity not only to read ebooks but also create them. Our 1st grade students produced a butterfly book which my class enjoyed reading and they loved the beautiful illustrations. This inspired them to create an ebook of their own. The first step was a collaborative brainstorming session to decide the most important and interesting things to include in the book. It was decided that each student would be responsible for writing and illustrating (via a photo taken with the iPad) one page. After deciding what to include and assigning pages, students used a graphic organizer as a pre-write to brainstorm ideas for their topic. The next step in the process was to write a paragraph using paper and pencil. Finally, students were ready to use Book Creator on the iPad to create their page. As students worked on various stages of the writing process, teachers met one-on-one with the students to help them edit their writing. Because this process was quite long, not every piece of writing was perfectly edited. We felt that it was important to actually finish the project and publish the book and teachers did not edit student work without the student’s participation. The writing you see, therefore, is authentic 2nd grade work and may contain some errors in spelling or grammar. Parents who own an iPad or iPhone could download the ePub file and directly drop it into their iTunes library. Once you sync your device with iTunes, you are able to read our ebook. For those parents who don’t own an Apple device, we also went to the length of publishing the book via Issuu, as per below. Being my first time using the iPads to create an ebook with students, I found that the learning curve was high for me. I think we started this project in November or December, and it wasn’t until February that I finally “published” the ebook in a format that parents can access on their own iPads. The part where the students used Book Creator was very straightforward and quite easy. Some of the issues were not learning-curve related, but were the usual school stuff: waiting for a sick student to return to school, scheduling problems, etc. The bulk of the issues were more related to management than actually using the iPads. It was management and organization, as well as the post-production that posed a challenge for me. I definitely became fluent with the process of taking screen shots and editing them on the iPad. The most challenging part was converting the ePub file to PDF for sharing on Issuu. In the end, once I found out how to do it (using Preview), this wasn’t difficult either. Was it worth it? I definitely learned enough to do it better next time. I hope that the kids are still excited about the book and that the parents will read it with them on their iPads. Andrea Hernandez is a Google Certified Teacher and teaches at Martin J. Gottlieb Day School in Florida, USA. Can more than one student work on the same book on different iPads and the same time? Once each student has compled their part of the book can it be sycked together? If you save the book using Dropbox and share it among different iPads, it is possible to work on it, but I wouldn’t recommend different students working on the same book as they will overwrite each others’ changes when they save the book. It would be better to get the students to create their parts of the book in separate books, save them to Dropbox and then use 1 iPad to combine the books. 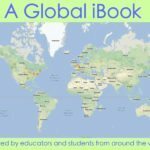 I’ve been looking for ways to use Book Creator in my classroom and this article has helped me in the brainstorming process. Thanks for posting.